Felissa's charity: St Jude's Children's Hospital - each year Felissa tries to raise as much money as possible for children who are at St Jude's Hospital. Felissa will use the money to donate toys and gifts to those who need it. 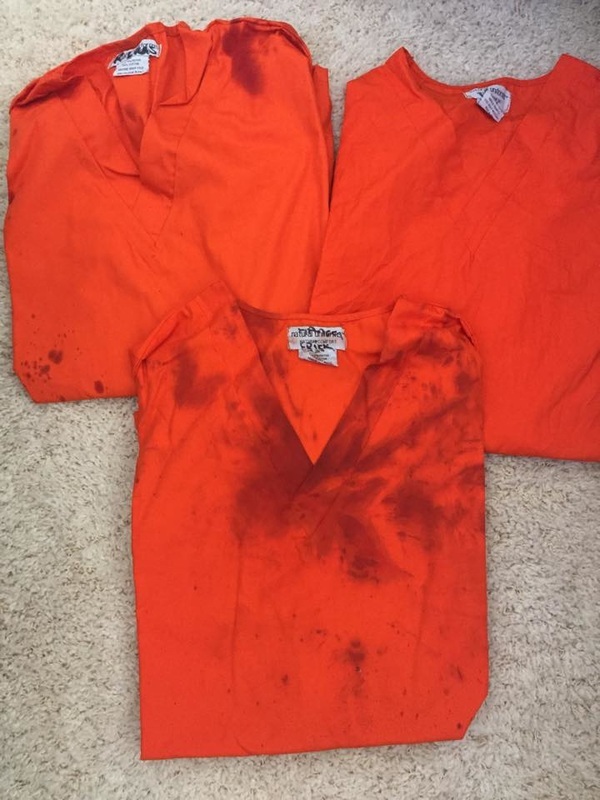 Prison outfits from Slayers music video 'Repentless' still covered in blood. Felissa was the producer on the video and these are genuine one offs! There are currently 7 prison t-shirts from the music video available for $30 each. If you would like Felissa to personalise and sign a t-shirt we are asking $40. For a complete prison inmate outfit worn in the video we are asking for a donation of $50 or $60 if you would like it signed and personalised. We currently have 3 full outfits. All the outfits were worn by inmates featuring in the music video for 'Repentless'. Check out the video below which may explain why they are covered in blood. If you are interested in helping us make some money for a very worthy cause just fill in the Charity Order Form below and let us know what you interested in. Be sure to include any personalisation you require, and clearly state your address as well as which item you are interested in. Why a Charity Order Form / What will happen then? We are using the 'Charity Order Form' because the items are extremely limited and one of a kind. We will treat each order on a first come, first serve basis. Once we receive the contact form from you - we will confirm if with you if you were successful in acquiring the item (s) you wanted. We will then email you the PayPal information needed to pay for your purchase (s). Once payment is received all items will be shipped to you. If we sell out of the items you require by the time your Charity Order Form comes through to us, we will notify you as soon as we can that we are sold out.